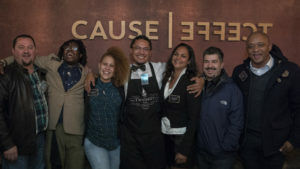 Africa was the source of inspiration when ten of the top bartenders from Cape Town came together on Tuesday, 8 May, to compete in the KWV Brandy Reimagined competition at Cause|Effect Cocktail Kitchen and Brandy Bar. 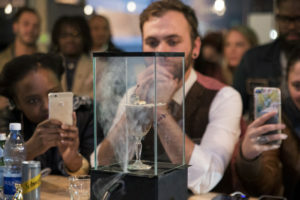 This competition seeks to identify SA’s top bartender, who will be crowned KWV Brandy’s Futurist – and walk away with a rare bottle of KWV Nexus valued at R24 000! KWV Brandy is considered part and parcel of South African culture, and it was, therefore, appropriate that most competitors led with ‘African-infused’ flavours and memories in their cocktails. Mixology consultant Roxanne Read was inspired by her childhood weekends spent swimming in the rain with the smell of braaivleis in the air. She brought these memories to life with ingredients smelling like freshly cut grass and used activated charcoal to emulate the smell of a dwindling braai fire. 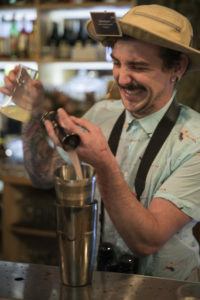 Aidan Powrie, who is not only a bartender but a chef and world traveller, continued the element of nostalgia by taking the judges on an African safari while preparing his drink. As a homage to his grandfather, he dressed in his safari attire, as a tribute to a man that was born in the same year as KWV – 1918. Other competitors included Thirst Bar Services’ own Sabrina Traubner who showed off her sassy personality not only in her presentation but with her aptly named brandy-based cocktail, the ‘Spicy Sabrina’ too. Talent Khawula, representing Haiku, drew his inspiration from the beautiful Cape Winelands by introducing flavours of Sauvignon Blanc wine to his cocktail named the Cape Wine Grape. Iranian born Marshall Behaein, representing Cause|Effect decided to focus on a drink specifically created for ladies, bringing in flavours of ginger, beetroot and chocolate. Marshall expressed his profound respect for KWV as a brand by boldly commenting that what most brands see as a goal to look towards, KWV brandy has already achieved, cementing KWV’s status as an industry leader. This respect for KWV Brandy was a constant theme throughout the night with almost all of the competitors mentioning that KWV Brandy played a significant role in their lives in one way or another. The KWV Brandy judges, KWV master distiller, Pieter de Bod; Dominic Walsh, owner of Mootee Cocktail Bar in Johannesburg; Jan Laubscher, prolific drinks commentator; respected drinks writer Leah van Deventer; charismatic Sunday Times S Mag editor, Thembalethu Zulu; influential trendsetter, Seth Shezi; and Cause|Effect owner and cocktail expert Kurt Schlechter were left with the challenging task of deciding on a Top 5. De Bod, Walsh and Zulu all mentioned their joy in seeing African themes and ideas inspiring the various cocktail recipes. 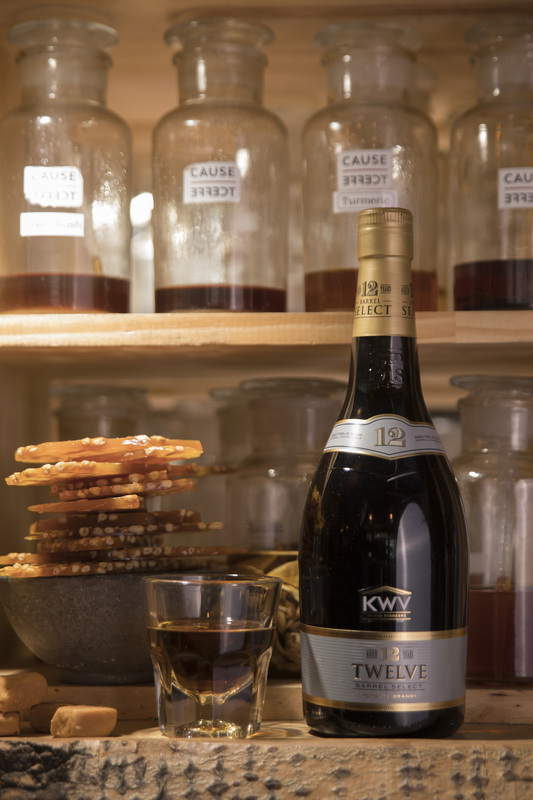 “It is exciting to see KWV Brandy Reimagined in such unique ways,” said Walsh. Judged on criteria of aroma, taste, appearance, balance, brandy pairing and presentation, it was Sabrina Traubner, Roxanne Read, Brent Perremore (consultant), Peter Lebese (Botanical Bar) and Melrick Harrison (Twankey Bar) who won the judges’ favour. The scores of the Top 5 from Cape Town will now be entered and considered against the Top 5 scoring bartenders from Johannesburg and Durban, following regionals at Mootee Bar in Johannesburg on the 22nd of May. The overall winner of KWV’s bartending competition will be announced at a Grand Finale at the House of Fire – the home of KWV Brandy in Paarl on the 12th of June. In addition to his Top 5 position, Peter Lebese also charmed his way into winning the KWV Brandy Personality Award for the bartender who best embodies the engaging spirit of KWV Brandy. This award was judged by celebrity judge Seth Shezi, and Peter was awarded a bespoke drinks trolley stocked with KWV product worth R7 000. “Brandy has traditionally been considered as a mixer with coke. This one-dimensional approach was definitely challenged tonight, with cocktails incorporating KWV’s award-winning brandies. It is inspiring to see that KWV Brandy elicited so much creativity from Cape Town’s top bartenders. Cape Town’s bartenders proved that KWV Brandies are incredibly versatile in their offering,” said Jerome Adonis, Brand Manager for Brown Spirits at KWV. A selection of the Top 5 KWV Brandy Reimagined cocktails from the Cape Town regionals will be served at Cause|Effect Cocktail Kitchen and Brandy Bar from the 29th of May to the 9th of June and KWV Brandy lovers are invited to sample these for a glimpse into the journeys the bartenders took in the development of their drinks. You can track the bartenders’ journey by following the hashtag #KWVBrandyReimagined and following KWV Brandy on Facebook, Twitter and Instagram.